Older children who can safely handle a low-temperature glue gun might like creating these homespun popcorn ball ornaments for the Christmas tree. These are very easy to make! Simply hot glue popcorn to the styrofoam ball, filling any open areas with broken pieces of popcorn. You can push the popcorn tight on the ball without it falling off and it’s a good idea to press firmly for a couple of seconds, until the popcorn has adhered completely to the foam. 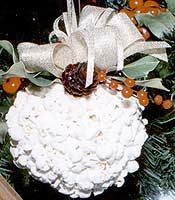 Poke a small hole in the foam ball and glue a loop of ribbon into the hole to create a hanger. Finally, glue a few Christmas embellishments around the hanger. Our sample uses small pine cones, berries and holly leaves. That’s it! Homemade, easy to do – and really quite pretty!